1 MALLIK: High concentrations of gas hydrates were documented in sands of the Mallik site on Richards Island in Canada’s Northwest Territories in 1972. This resulted in three landmark gas hydrate evaluation programmes with corresponding test wells being carried out here in 1998, 2002 and 2007/2008. These programmes confirmed that gas hydrates could be produced by drilling wells and that depressurization appeared to be the most favourable method. 2 North Slope: Gas hydrates were discovered and tested in the North Slope region of Alaska in 1972 at the Northwest Eileen State #2 well. The objective of the test wells was to evaluate the oil reserves, but the drilling also enabled initial estimates of the reserves of gas hydrate. The magnitude of the hydrate deposits was estimated at around 16 trillion cubic metres. Little further attention was paid to the hydrate deposits until the Mount Elbert test well was drilled nearby in 2007. In 2008 the United States Geological Survey (USGS), the most important organization for official mapping in the USA, assessed a volume of 2.4 trillion cubic metres of recoverable gas in the region with the technology existing at that time. A well was drilled in Prudhoe Bay in 2011 to test for the production of gas hydrates. 3 Blake Ridge: This area of the continental slope off the coast of North Carolina was one of the initial sites for gas hydrate research in the marine realm. Hydrate deposits were discovered during a seismic geophysical survey of the sea floor. The methane hydrate layers below the sea floor were revealed by conspicuous reflection patterns in the bottom seismic profiles, referred to as bottom-simulating reflectors (BSR). Scientific drilling in 1995 confirmed the existence of an extensive deposit. The gas volumes were assessed at around 28.3 trillion cubic metres. Concentrations of the gas here, however, are relatively low. 4 CASCADIA CONTINENTAL MARGIN: This area off the Pacific coast of the United States was drilled by the Ocean Drilling Program (ODP). The objective of this international programme is to acquire new knowledge about the structure of the Earth and its history through scientific drilling of a large number of holes in the sea floor. On two cruises in this region, in 2002 and 2005, the “hydrate ridge” off Oregon was drilled. 5 GULF OF MEXICO: Massive gas hydrate mounds were discovered on the sea floor here in 1995. These structures are particularly interesting because of the special biological communities that have developed here. Later, gas hydrates were found in marine sands in a well in Alaminos Canyon Block 818. These kinds of deposits are significant because it is relatively easy to recover hydrates from sands. In 2005, a joint project involving researchers and industry partners addressed the safety aspects of deepwater drilling. A second drilling expedition in 2009 revealed high concentrations of gas hydrates in sand reservoirs. 6 INDIAN OCEAN: Gas hydrates were investigated during a 113-day expedition at one site in the Arabian Sea, two sites in the Gulf of Bengal, and one site in the Andaman Islands. Off the southeast coast of India, at “site 10” in the Krishna-Godovari Basin, the researchers discovered a 130 metre-thick layer containing gas hydrate. This exhibited high hydrate concentrations. 7 SVALBARD:: A number of studies have been carried out on the shelf off the western coast of Svalbard Island. 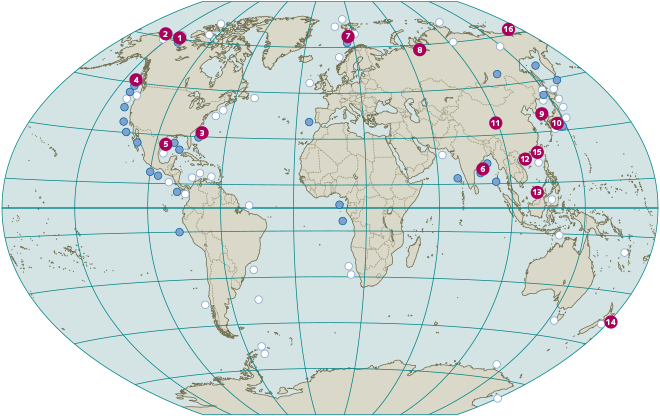 Early in this century several active methane gas seeps were found. These presumably originate at the edge of the gas hydrate stability zone (GHSZ). Scientists believe that the hydrates are dissociating here due to climatic changes. 8 Messoyakha: This oil and gas field in western Siberia provided the first solid evidence for the existence of gas hydrates in nature. Drilling and various measurements suggest that the gas hydrate contributes a share to the production of natural gas in this area. 9 Ulleung-Basin: Deep-sea drilling was carried out in the Ulleung Basin off the coast of South Korea in 2007 and 2010. The expedition also retrieved cores. Numerous vertical “chimney” structures were discovered with high concentrations of gas hydrates. The hydrates apparently occur here in the pore spaces of sands and in deformed muds. 10 NANKAI TROUGH: The first resource-grade gas hydrates in marine sands were discovered in this area off Japan in 1999. Further geophysical studies and a second drilling programme in 2004 revealed the presence of gas vol-umes in the Nankai Trough of 1.1 trillion cubic metres. Around 566 billion cubic metres of this occur in high concentrations in sands. Methane was produced for the first time from a test well in the sea here in 2013. After the well in the Nankai Trough in 1999, the industry well in Alaminos Canyon Block 818 in the Gulf of Mexico in 2003 was the second discovery of gas hydrate in marine sands. 11 QILIAN MOUNTAINS: This mountain range on the Tibetan Plateau in wes-tern China has permafrost extending to depths of up to 100 metres. Drilling projects here in 2008 and 2009 confirmed the presence of gas hydrate occurrences in fractured sandstones and mudstones. These rocks were formed during the Jurassic geological period around 200 million years ago. 12 SHENHU BASIN: This area of the South China Sea was explored in early 2007 during marine geological mapping by the Guangzhou Marine Geological Survey (GMGS), a Chinese state institute for marine geology. Gas hydrate concentrations discovered in the fine-grained sediment layers were higher than expected, probably as a result of relatively high silt content and deposits of planktonic foraminifera, microscopic organisms with carbonate shells. 13 Gumusut-Kakap: In this oil field off the shore of eastern Malaysia potential geohazards with respect to industrial production of deeper oil and gas deposits were studied for the first time in 2005. These include possible slumps or tsunamis. The project concentrated mainly on oil and gas deposits underlying gas-hydrate bearing layers. 14 NEW ZEALAND: Strong BSR seismic signals were recorded in the early 1980s during sea-floor investigations of this area on the margin of the Hikurangi Trough off the East Coast of New Zealand. Since then the region has been studied more intensively using a variety of other kinds of measurements. Further expeditions to various sites within the Exclusive Economic Zone of New Zealand suggest that gas hydrate deposits could be present in many other areas there. 15 Taiwan: Taiwan lies in a region where continental plates converge. In this area methane-bearing water is pressed out of the sediments so that meth-ane is available for the formation of hydrates. The tectonic collision zone has been intensively studied by drilling since 2004. The drilling programme has produced clear evidence of the presence of gas hydrates. The hydrates presumably encompass around 11,000 square kilometres of sea-floor area, which is equal to the size of the West African country of Gambia. 16 EAST SIBERIAN SHELF: The East Siberian shelf is a former coastal area with permafrost that was flooded by sea-level rise after the last Ice Age. Scien-tific studies discovered high concentrations of methane in the sea water and upper layers of the sea floor. The origin of the methane is uncertain. It may possibly come from methane hydrates stored in the relict permafrost of the submerged coastal area.